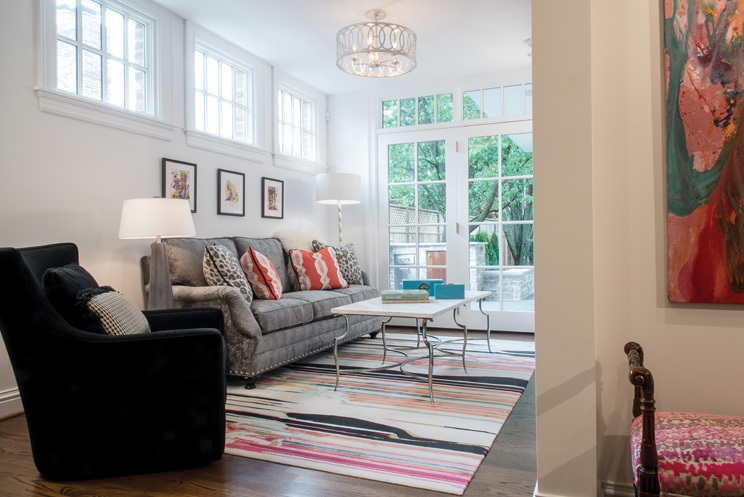 Mixing “the old with the new,” renovation of this gracious Clayton townhouse was a joyful adventure for the owners and their designer. 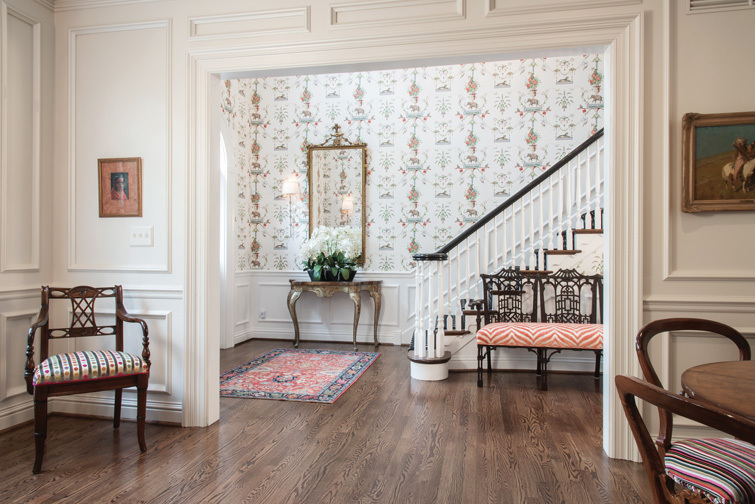 Authentic to its era, but “fresher and more lively,” the main staircase was simplified and the foyer brightened with crisp white wainscoting, a neoclassical wallpaper design, colorful textiles, and an antique table, settee, and Regency mirror from Jules Pass. Formerly the library, the dining room showcases heirloom portraits of the owner’s historic ancestors, paintings by Oscar Berninghaus, and a crotch mahogany Theodore Alexander table, surrounded by Regency-styled chairs in a dynamic blend of fabrics. 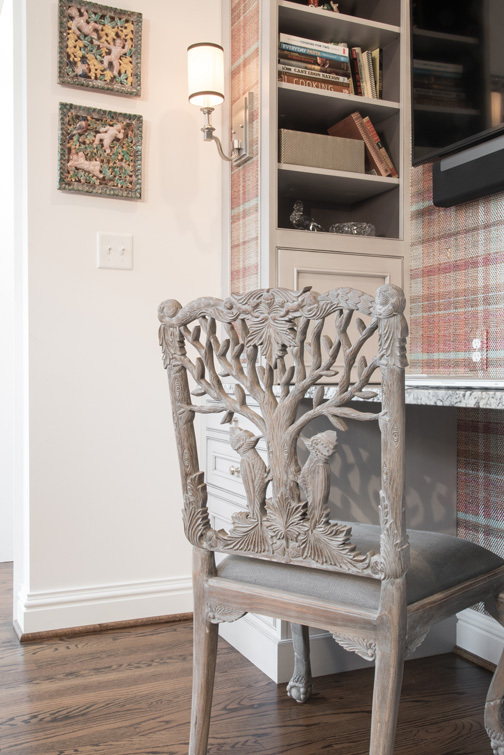 Comfy seating and colorful accents make the keeping room a favorite spot to relax. Significantly expanded, the remodeled keeping room is filled with natural light and overlooks the veranda and exquisitely landscaped rear yard. Masterfully detailed, the kitchen showcases custom cabinetry in various shades of purplish/gray; granite surfaces and herringbone mother-of-pearl backsplashes; an 11-foot island with farmhouse sink and swirled columns; swivel counter stools with graceful Napoleonic backs; mirrored refrigerator doors; and crystal chandeliers from Wilson Lighting. 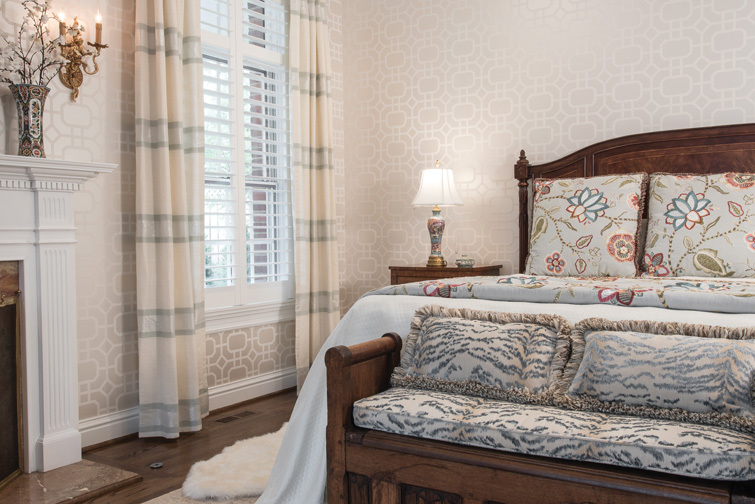 The master bedroom establishes a softer, more tranquil mood with pearlized flocked wallpaper, filmy drapes, embroidered June Churchill bedding, and antique nightstands and lamps from Jules Pass. A cushioned church pew serves as a bench at the foot of the Theodore Alexander bed. 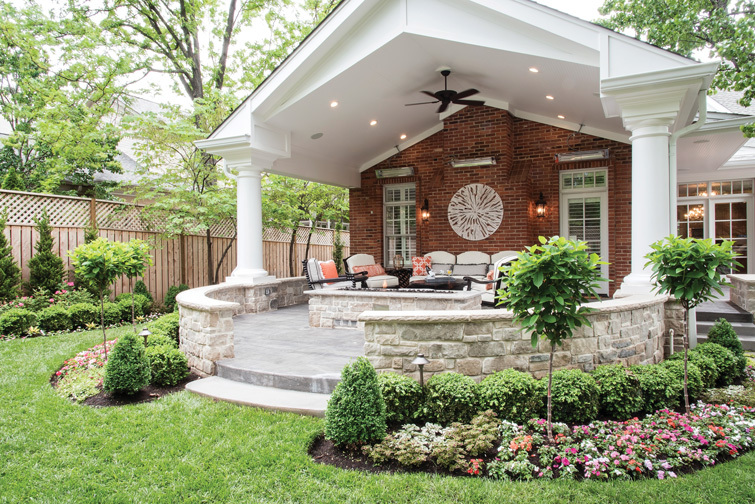 Superbly designed, the columned veranda integrates beautifully with the “English garden” landscaping. 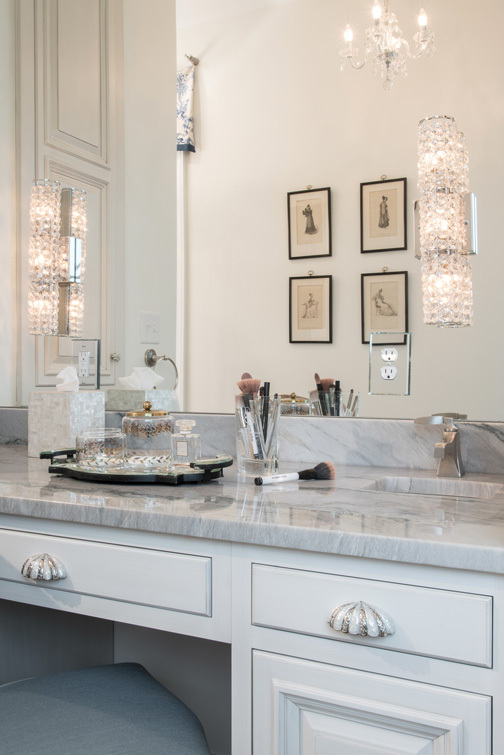 The wife’s personal vanity area is appointed with a quartzite top, miniature Kallista sink, mother-of-pearl pulls, and crystal sconces. Ready to scale down from their stately family residence in Frontenac, these well-traveled, fun-loving empty-nesters began looking for a home better suited to their newfound freedom. The vibrant, semi-urban atmosphere and walkability of Old Town Clayton proved irresistible and, in 2016, the couple found a 1980s-vintage Georgian townhouse that could be adapted to their lifestyle and many interests. What makes this renovation particularly intriguing is the husband’s lineage as a direct descendant of Auguste Chouteau, William Clark (of Lewis and Clark fame) and several other historic figures. An avid outdoorsman, prominent business owner and amateur historian, his list of must-haves for the project included space for his heirloom art collection, antiques and extensive library; a storage area for his sporting equipment; a wine room; and, thinking ahead, handicap accessibility. The living room’s dark-paneled walls were converted to a creamy hue with a metallic sheen that optimizes the light streaming through the arched windows. 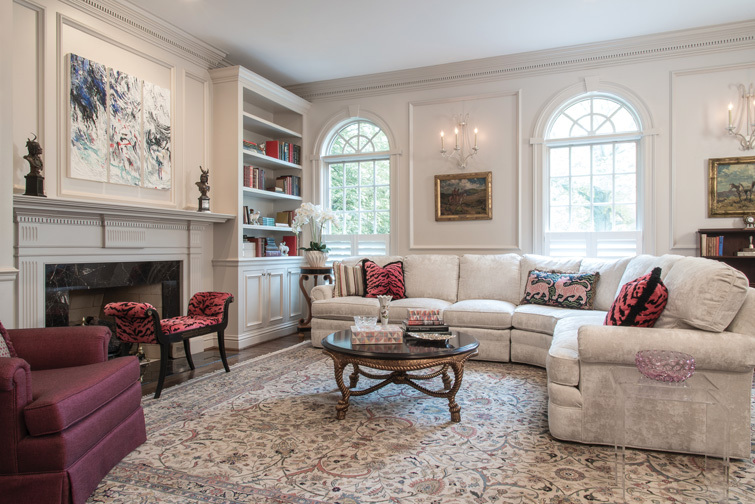 Floor-to-ceiling bookcases were added on both sides of the existing fireplace, and every piece of millwork was meticulously matched to the original. 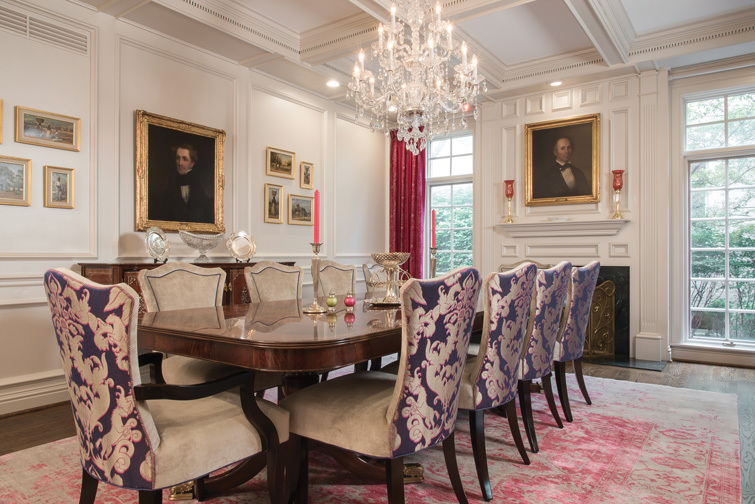 Previously a library/study, the adjacent room was transformed into the formal dining room. Here, the bookcases were removed and replaced with picture frame trim. The existing small opening from the main hall was enlarged creating an arched entryway into the dining room accented with pillars, and in place of the dark paneling, subtle silver metallic paint gives the space luminosity. Some of the furnishings throughout the townhouse had come from the owners’ former home, but were reupholstered for a more transitional look. The dining ensemble, however, was newly acquired. Seating 10, the Theodore Alexander dining table is inlaid crotch mahogany and complemented by a burl wood Jonathan Charles sideboard inlaid with mother-of-pearl. Above the table, a Venetian-style mirrored medallion and crystal chandelier add a touch of bling. Describing the wife as a “fabric connoisseur” and “fearless with color,” Lombrano indicated the Regency-styled Designmaster dining chairs, each covered in a tasteful combination of four different fabrics to “make a statement.” Similarly bold, embroidered silk drapes in rich magenta line the windows. The dining room’s dignified ambience made it the perfect setting for several of the cherished paintings handed down through the husband’s family for generations. Painted in 1856, a portrait of his three-times-great-grandfather, once governor of Kentucky, hangs above the fireplace. Over the sideboard is an original portrait of William Clark. On display elsewhere are a portrait of Clark’s wife, Julia, daughter of American statesman John Hancock, and a variety of western and sharecropper art pieces by St. Louis-born Oscar Berninghaus and William Aiken Walker, also one of Oprah Winfrey’s favorite painters. The kitchen/keeping room area was significantly expanded and an archway was created to maximize the openness of this combined space. Lombrano chose subtly varying shades of purplish/gray for the kitchen cabinetry, custom-designed by Accents on Cabinetry. Like all of the home’s stonework, the granite countertops and 11-foot island surface were fabricated by Metro Marble & Granite. Among the kitchen’s other eye-catching appointments are a herringbone mother-of-pearl backsplash, hammered nickel pulls, mirrored refrigerator doors, a Wolf induction cooktop and the farmhouse sink’s distinctive plumbing fixtures from Immerse. 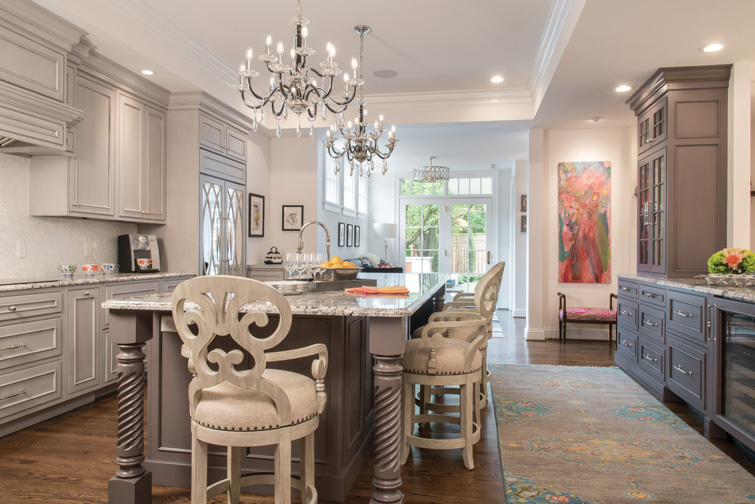 Crystal chandeliers light the island, which is surrounded by Napoleon-backed swivel counter stools, and a cleverly disguised “dog station” provides a bowl nook for the couple’s beloved Shih Tzu. Transom windows flood the keeping room with sunlight and offer a lovely view of the rear yard. 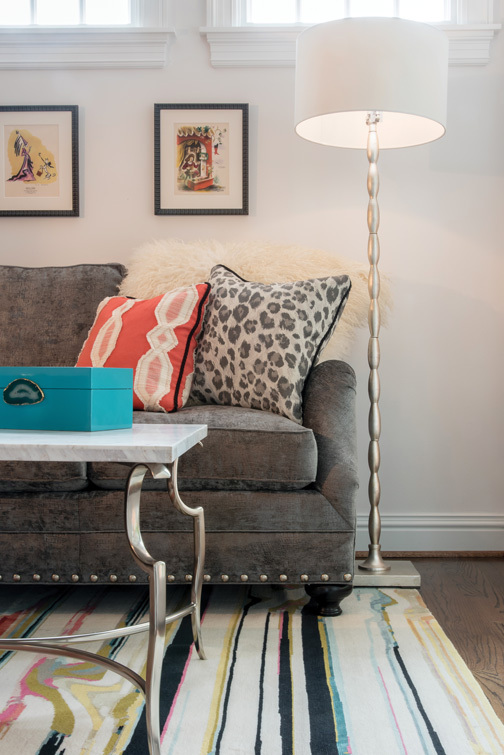 New furnishings were purchased for this colorful gathering space, and grasscloth wallpaper in a metallic plaid adds a touch of whimsy to the recipe desk alcove. Significant structural changes were made to the main-floor master suite, as well. One exterior window was converted to a door accessing the veranda. Other windows were removed to create wall space for the new Theodore Alexander bed; the marble surround on the fireplace was replaced and the traditional mantel retained; and the original dining room was reconstructed as the master closet, with a custom jewelry armoire and chandelier. To achieve a softer, more tranquil mood, the master bedroom is appointed with flocked, pearlized wallpaper; ethereal, shimmery drapes; and épinglé textiles reminiscent of chinoiserie. Antique lamps and nightstands flank the bed, and at the foot, a cushioned church pew serves as a bench. Responding to the wife’s love of beauty, GK Landscape Design transformed the yard into an exquisite English garden with water feature. And completing the husband’s wish list, the lower level of the townhouse was remodeled to include a wine cellar for his favorite vintages, a “sports closet” for his vast assortment of fishing and hunting equipment, and an exercise area, family room and bath. Elegant yet lighthearted, every detail of the refurbished townhouse reflects the joie de vivre of its owners. “It was a collaborative effort,” Lombrano says modestly. The delighted owners, however, would be more inclined to describe this extraordinary residence as proof of the designer’s expertise and unique ability to fulfill her clients’ vision.